Worsening inequality is a key challenge of our time. Evidence from Oxfam illustrates that next year, if current trends continue, the richest 1% of humanity will own half of global wealth. Our own computations show that over the MDG period (1990-2015), nearly 4 people in 5 lived in countries where the bottom 40% of the income distribution grew more slowly than the average. We should be concerned about inequality for many reasons – just one of them is that it is intimately linked to levels of absolute deprivation. Growth can reduce poverty even if offset by rising inequality but it makes the challenge much harder. In light of the global call of the SDGs to ‘leave no one behind’ and the proposed target that the incomes of the bottom 40% within countries should exceed national averages, it becomes pertinent to think about what the poverty reducing effect might be. One potential approach, featured in a recent World Bank working paper, is to undertake poverty projections over the next 15 years under different inequality scenarios. Another, which we adopt, is to estimate how many people would be poor today according to the $1.25 a day benchmark if countries had experienced more equal growth over the last 30 years. Using some simplifying assumptions, we explore two scenarios. Under the first, ‘equal growth’, we assume the bottom 40% of the population grew at the same rate as the average of their country. Under another, ‘pro-poor growth’, we assume the bottom 40% grew faster than the average (we considered gaps of 1 to 3 percentage points, in line with the actual experiences of some countries in the past 3 decades). We wanted to keep overall growth constant so that we isolated the impact of inequality – this meant that any increase to the growth of incomes of the bottom 40% had to be subtracted from the incomes of richer people within that country. We considered two possibilities – if this income was subtracted equally from every person in the top 60% of the society, and if it came solely from those fortunate enough to be in the top 10%. The headline finding: many fewer people could have been left behind in extreme poverty had growth been more equal over the last 30 years. We first illustrate this claim, then highlight an important caveat. If all people within each country had experienced equal income growth, around 200 million more people – about 1 in 5 of those that are currently very poor – would have escaped extreme poverty. Interestingly, the difference is entirely due to unequal growth in many of today’s middle income countries (Chart 1). On average, today’s low income countries experienced relatively equal growth between the bottom 40% and the average. Under this scenario, China could have effectively eliminated extreme poverty along with countries including Mexico and Peru. In other words, while growth played a key role in reducing extreme poverty in fast growing middle income countries like China, if growth had been equal, the impact on poverty could have been much bigger. Fewer than half as many people would live in extreme poverty today if the incomes of the bottom 40% of people in each country had grown two percentage points faster than the average. For example, extreme poverty could have been eliminated in Indonesia and Philippines and could have fallen to around 5% in India and Vietnam. This level of pro-poor growth is possible as it actually did occur in around a quarter of countries. In too many countries still, poverty rates over 40% are part of recent history or current reality. In these places, redistributing income bluntly from the top 60% of the population can actually increase poverty levels if it pushes people that were above the poverty line below it. One alternative is that these high-poverty countries redistribute income growth from the top 10% of their population alone – this is likely to reduce poverty in most but not all the countries we examined. Whether growth is redistributed from the top 60% or the top 10% also has a potentially big impact on the global poverty (Chart 2). If growth is redistributed away from top 60%, then extreme poverty starts to increase when growth is more than 2 percentage points higher for the bottom 40% relative to the average. In contrast, if growth is redistributed away from top 10%, the global poverty rate continues to decline. So what can we learn from past experience? 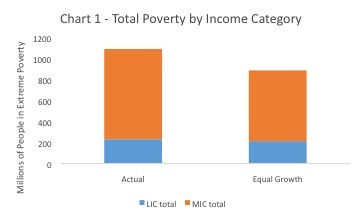 This analysis illustrates that significantly more poverty reduction could have occurred if the income growth of the bottom 40% of the population was higher than the average in many MICs. In contrast, in most LICs this would have done very little to eliminate extreme poverty. To move towards the SDG poverty goal – to ‘end poverty in all its forms everywhere’ – growth needs to be more equally distributed in middle income countries. While in LICs, growth needs to be higher while continuing to be relatively equal across the distribution. But we also show that governments need to be very careful in how they redistribute in order to avoid perverse outcomes. ‘Leaving no one behind’ will require a careful mix of global ambition and careful attention to country realities. 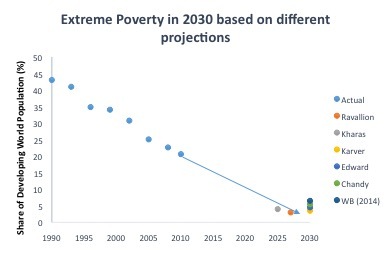 Is extreme poverty going to end by 2030? The Overseas Development Institute (ODI) has just released a report including a chapter that provides an overview of existing work on projections of extreme poverty to 2030. Ending extreme poverty (defined as living below $1.25 a day 2005 PPP) by 2030 is a central part of the global development agenda. It is at the heart of the United Nations Sustainable Development Goals, the World Bank has made it a key goal, and NGOs, such as the Global Poverty Project, are mobilising hundreds of thousands of people to encourage global leaders to achieve zero poverty by 2030. But is ending extreme poverty by 2030 achievable? Before addressing this question directly it is worth highlighting the historical significance of this goal. Extreme poverty was the common experience for most of human history until recent generations. Former World Bank Economist, Martin Ravallion, has estimated the historic reduction in the number of people living in extreme poverty in the developed world using data on income and inequality (see here). While it is difficult to be exact, he provides the best insight available into historical trends in poverty reduction, which is shown in the chart below. It was not too long ago that developed countries had similar rates of extreme poverty to what developing countries have today. For example, over three-quarters of the populations of Australia, Canada and New Zealand were in extreme poverty 200 years ago, which is on par with the poorest countries in the world today. 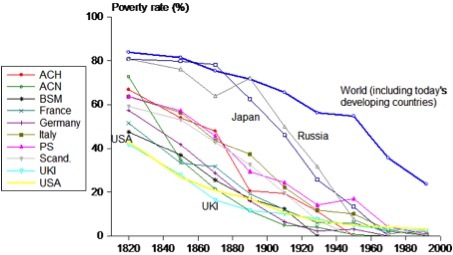 Only by 1950 had extreme poverty been eliminated in these countries. In addition to the relatively recent elimination of extreme poverty in developed countries, extreme poverty began falling rapidly in developing countries over the last half century. The first Millennium Development Goal, to halve extreme poverty in the developing world between 1990 and 2015 was met five years ahead of schedule. If these trends continue the world would seem to be on track to be free from extreme poverty in the foreseeable future. The best available estimates suggest that the world will come close to ending extreme poverty by 2030, but that there will still be more to be done. Most projections show that around 3 – 7% of the developing world population (around 200-600 million people) will remain in extreme poverty in 2030. 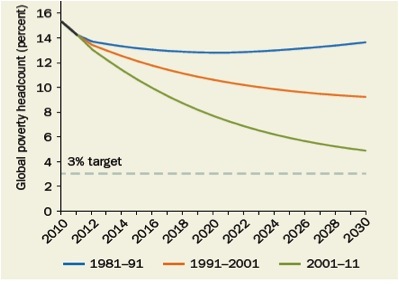 The projections in the ODI report, shown in the graph below, are based upon a ‘business as usual’ approach whereby strong economic growth in the developing world continues as it has over the last decade or so, inequality remains constant and the potential effects of climate change are ignored. Clearly these assumptions are simplistic. One of the authors of these studies, Lawrence Chandy from Brookings, even highlights that predicting poverty into the future is a ‘fools errand’ (see here). Yet these projections provide a helpful guide as to what the world is on track to achieve. 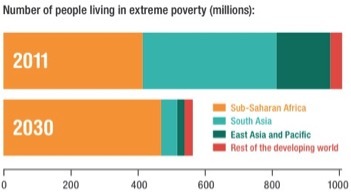 Where will those remaining in extreme poverty live? A major shift of the geographical concentration of global poverty is expected to continue over the next 15 years. Since the 1990s the vast majority of the reduction in people living in extreme poverty occurred in East Asia, with only slight decreases in South Asia and increases in the number of people living in poverty in Sub-Saharan Africa. As the chart below shows, over the next 15 years, the bulk of the reductions in poverty is expected to occur in South Asia, leaving almost all the world’s extreme poor living in Sub-Saharan Africa. What role does inequality play? A major assumption underpinning these projections is that the distribution of economic growth across the income distribution remains constant. 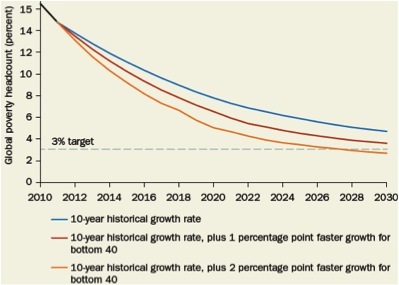 A recent World Bank working paper highlights that there will be significantly different outcomes for the proportion of people living in extreme poverty in 2030 depending on the distribution of growth across the income distribution. The paper shows that if the bottom 40% could grow two percentage points faster than the average, the proportion of people living in extreme poverty could fall below 3% of the world’s population by 2030. However if the bottom 40% grows at two percentage points slower than the average, almost 10% of the world would remain in extreme poverty in 2030. While eliminating extreme poverty by 2030 would be an amazing milestone for humanity, it is important to keep in mind that development doesn’t stop there. The extreme poverty definition only provides a very limited snapshot of people’s standard of living, through the lens of changes in consumption. In addition, even though there has been significant progress in reducing the number of people living below $1.25 a day, the majority of the developing world still live below $4 a day. Furthermore, if climate change and other global development challenges are not addressed in the coming decades, progress against reducing extreme poverty could easily be reversed. 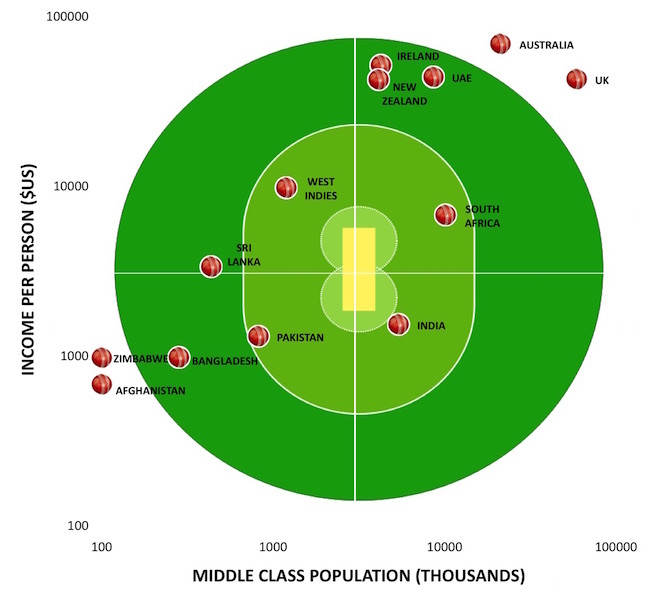 Have you ever thought to yourself how unequal the playing field is in the Cricket World Cup? Some of the world’s richest countries, like Australia and the United Kingdom, compete against some of the world’s poorest countries, like Zimbabwe and Afghanistan. To indicate the upper hand some countries have over others, the graph below ranks countries by income per person and the size of their middle class population (measured by developed country standards). The richest country, Australia, has 100 times more income per person than the poorest country, Afghanistan. Surely this unparalleled high standard of living partly explains why Australia has won more World Cup titles than any other country. The United Kingdom has around 1000 times more people in the middle class than Zimbabwe. The size of the middle class is a better measure than just population alone because despite some countries like India having large populations, many live in extreme poverty. Defining middle class by developed country standards (living over $US13 a day) ensures a fair comparison of the same standard of living can be made across both developed and developing countries. Ultimately this measure illustrates the point that countries are not competing on a level playing field. So this World Cup, are you going to go for a rich and highly populated country or a country that despite being relatively poor is punching above its weight? 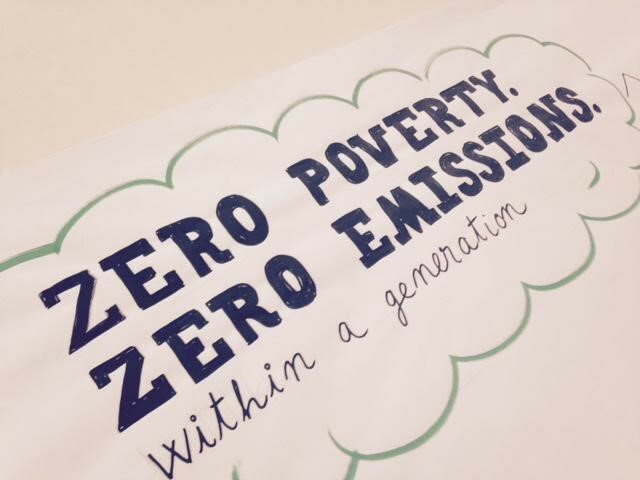 Are Zero Poverty and Zero Net Emissions Compatible? However achieving zero extreme poverty on the pathway to zero net emissions can only be achieved through reducing inequality. Extreme Poverty will not be eliminated by 2030 unless there is a historically unprecedented reduction in inequality. The continuation of recent high economic growth rates for the next 15 years will not be enough to reach a 3% global extreme poverty rate by 2030. For extreme poverty to be eliminated, the incomes of the bottom 40% of the income distribution (the poorest people) must grow an extra two percentage points higher than the average economic growth rate for the next 15 years. The latest estimates from the World Bank show that eliminating extreme poverty by 2030 is beyond humanity’s grasp, unless unparalleled steps are taken to reduce inequality. This is an important finding given that world leaders are set to commit to ‘Zero Poverty’ by 2030 as part of the United Nations Sustainable Development Goals (SDGs) Agenda. Reducing poverty and the SDGs are clearly about more than increasing incomes through economic growth. They are about broader issues such as health, education, gender equality, environmental sustainability, employment etc. However at the heart of SDGs is the notion of eliminating extreme poverty (defined as 3% or less of the world’s population living below $1.25 a day). The continuation of recent high economic growth rates throughout most parts of the developing world will not be enough to reduce extreme poverty. 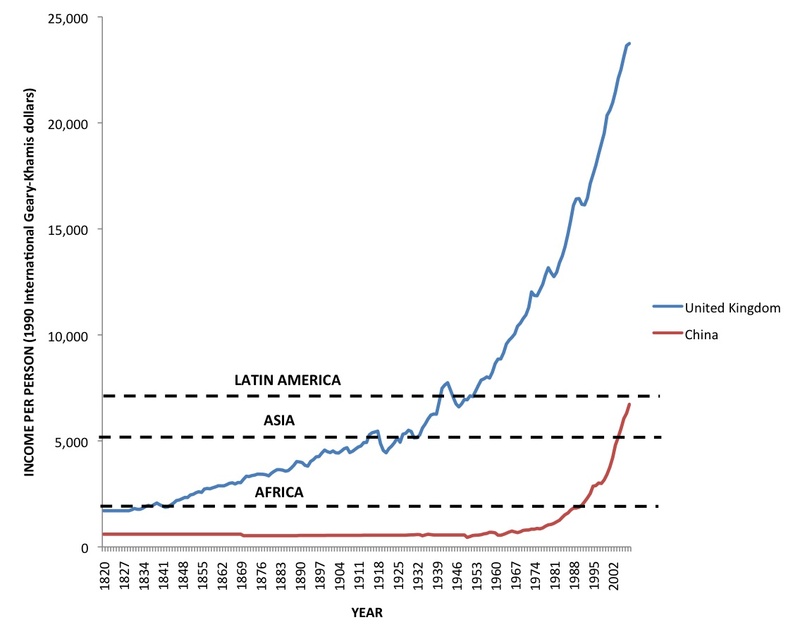 Figure 1 shows how the global poverty rate is likely to change based upon historical growth patterns. Even in the best-case scenario, extreme poverty is likely to remain above 5% of the world’s population by 2030. While if growth rates are lower than they have recently been, like they were in the 1980s, then the global extreme poverty rate could be as high in 2030 as it is today. The above predictions hold inequality constant. However if inequality was also reduced, along with these patterns of economic growth, extreme poverty could be eliminated. 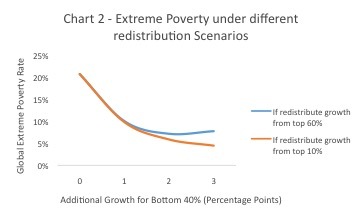 Figure 2 shows that if the incomes of those in the bottom 40% of the income distribution grow by an extra two percentage points faster than the average growth rate the target of a 3% global extreme poverty rate can be reached. This relies on growth rates continuing to be as high as they were in the 2000s and that the poorest people benefit the most from economic growth. Reducing inequality alongside growth appears to be a key factor in eliminating poverty. However achieving this will require significant changes to see the poor benefit the most from economic growth. These changes are essential if world leaders are serious about Zero Poverty being reached by 2030. What does the G20 have to do with the World’s Poor? This week World Leaders are meeting in Brisbane, Australia for the 2014 G20 Summit. To find out more about what this has to do with the World’s Poor, check out the infographic below and this blog. A number of world leaders, including the Australian Prime Minister, have claimed that millions of people have been lifted out of extreme poverty and are now living in the “middle class”. However, there is no universally accepted definition of “middle class” and the use of this term is often very misleading. The “middle class” in developed countries, such as Australia, have substantially higher living standards than the vast majority of people in developing countries. While there have been large reductions in extreme poverty over the last twenty years, 93% of people in the developing world still live below the United States’ national poverty line of less than US$13 a day. Earlier this year, the Australian Prime Minister claimed that hundreds of millions of people have been lifted from extreme poverty to “middle class” and there are now almost two billion people in the global “middle class”. Statements such as this do not represent how the notion of “middle class” is typically understood in the developed world. The lowest possible standard of middle class in a developed country is living above the United States’ national poverty line (defined as $13 a day (2005 US PPP)). According to the latest World Bank data, 93% of the developing world’s population live below this line. 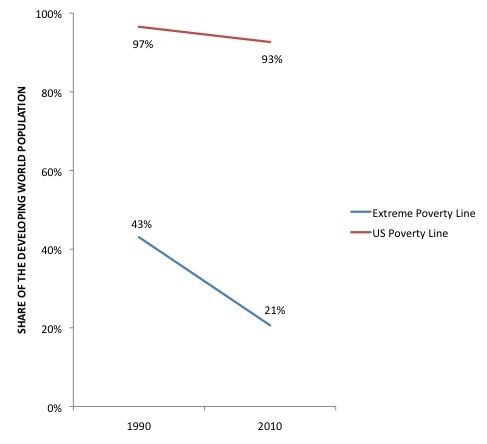 As the chart below shows the huge decline in people living in extreme poverty has not been matched by a decline in the share of people living below the United States’ national poverty line. The incredible reduction in the population living below the extreme poverty line (shown in the chart above) should be celebrated. However this should not be misrepresented to suggest most of these people live in “middle class” by any developed country standard. This weekend, hundreds of thousands of Australians gave up something they live with everyday (food, furniture, technology etc) to fundraise as part of World Vision’s 40 Hour Famine. This year the focus is on alleviating poverty in Rwanda, particularly reducing hunger in children under five-years old. The table below provides a snapshot into just how different life is like in Rwanda compared to Australia. For example, for every 1 maternal death in Australia, there are 143 in Rwanda. While for every $1 spent per child on primary education in Rwanda, over $300 is spent per child in Australia. As the 2014 Commonwealth Games come to end have you ever wondered how fair the playing field is? Most members of the Commonwealth are developing countries and many are small islands. Only a few countries, like the United Kingdom, Australia and Canada, are rich enough and have sufficiently large populations to have well nourished populations that have time to hone their skills in competitive sports. This significantly reduces the competition at the top of the medal tally. For example, to illustrate the inequality between Commonwealth countries compare the richest and poorest countries. The richest country, Australia, has over 125 times more income per person than the poorest country, Uganda. Countries rankings would change dramatically if the medal tally were revised to adjust for differences in income per person and population size, as has been done for the table below. This removes disparities in wealth and population and allows for a fairer comparison of how countries have performed. Small islands countries and some African countries perform substantially better when the medal tally is revised to take into account income per person and population size. Nauru, Samoa and Kiribati take the top three places because they are middle-income countries with tiny populations and still managed to get five medals between them (including a gold and three silver). While Australia, the United Kingdom and Canada fall to the bottom third of the rankings.